It involves staring at images of vertical and horizontal lines, and it can make you see black and white as green and red for up to three and a half months. The McCollough effect was found by psychologist Celeste McCollough Howard in Canada in 1965, and involves staring at a black and white test image for up to a minute. This is followed by staring at horizontal and vertical red and green lines, causing other lines to appear red and green. 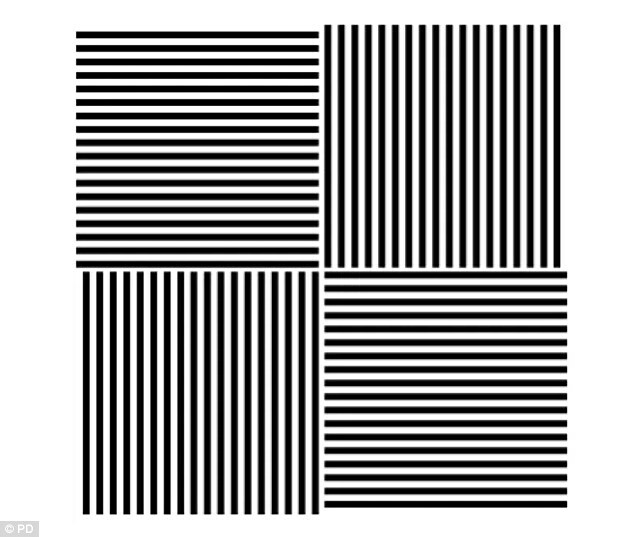 To perform the trick, first look at a test grid image of black and white horizontal and vertical lines to confirm they appear black and white. Next, you must stare alternately at a square containing horizontal red and black stripes, and then a vertical green equivalent for up to three minutes - alternating between staring at the centre of both for several seconds. Once this is done, stare back at the original grid image of black and white gratings. Now, instead of appearing black and white, the top right and bottom left vertical gratings will have a pinkish hue, while the top left and bottom right horizontal gratings will appear slightly green. Look at this test image below to confirm that it appears black and white. Stare alternately at the centre of these coloured induction images for up to three minutes. You should stare at the centre of one for several seconds, before switching to the other for a few seconds, and back again repeatedly. Look back at the test image above. You should find that the vertical sections in the bottom left and top right appear very slightly red, while the horizontal sections top left and bottom right will appear slightly green. The effect will be more pronounced if you spent longer on step two. You’ll notice that even after a few minutes, the effect is still noticeable. The effect can actually remain for up to three and a half months, and may be noticeable on other horizontal and straight lines aside from the ones in the grid. To reverse the effect, you simply need to stare at the original inducion images again, but rotated 90 degrees counter clockwise, for half the time you originally stared at them. The rotated image is shown below. The longer you perform the initial trick, anywhere up to 15 minutes in total, the more pronounced the effect will be. But unlike many optical illusions, the most bizarre thing about this one is that, even after several minutes, the effect is still noticeable. In fact, reports by Dr McCollough suggest that it can last up to three and a half months. Fear not, though; if you want to reverse the effect, you simply need to stare at the original coloured images again for half the time you originally looked at them, but rotate them 90 degrees counter clockwise. As explained, this trick isn’t taking place in the retinas of your eyes. Instead, the McCollough effect, for some reason, works in the level of the brain. The McCollough effect is a very rare thing. It’s quite scary. It’s a real image that can lock into your brain, change the way it works, and stick around for a good while. The exact reason the trick works, however, is not completely understood.